which leads from the airport (LAX) to the Watts/Willowbrook area. 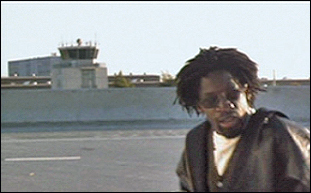 freeway in "Speed", chances are you're looking at the 105.
crisscrossing just north of the 105 freeway. The street on the left (west) is Wilmington Avenue. bomb on Sandra's bus, and that once the bus goes over 50 MPH, the bomb will activate. Once it activates, the bomb will explode if the bus's speed drops below 50 MPH. So Keanu jumps in his land rover and races to catch up with the bus, to warn them. end of the Century (105) Freeway, just a block west of Sepulveda Blvd. In the photo above, we see Keanu chasing Sandra's bus on the freeway. under the Prairie Avenue overpass of the Century (105) Freeway. Notice that the embankments (sides) of this freeway are still just bare dirt. groundcover. These sides were bare because the freeway was brand new. with the bus driver, asking him to just drive right over the other cars. Century (105) Freeway, just east of Doty Avenue, north of the Hawthorne Municipal Airport. The scene below was shot a bit closer (farther east) to the Crenshaw exit, near Yukon Ave.
just west of the Crenshaw Blvd exit. his Jaguar XJS, driving like a speed demon down the freeway, upsetting the owner. Century (105) Freeway, near Yukon, west of the Crenshaw Blvd exit. it into the speeding bus (much to the chagrin of the Jaguar's owner). 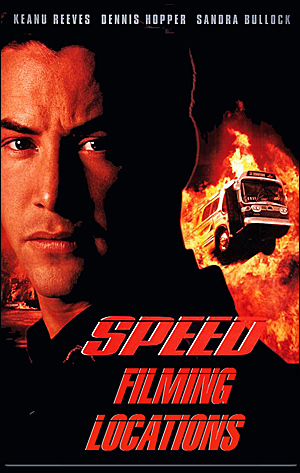 actually filmed when both Keanu and the bus were heading west on the 105, not east. Yes, they have actually turned around and are going the opposite direction! They were passing Prairie Avenue overpass at the time. is also indicated by the shadows, which are pointing to the north in this scene. then jumps onto the bus (causing the poor Jag-owner to crash his car into a water-filled barrier). With Keanu aboard the bus, the police scramble into action. In the photo above, a police team boards a helicopter on a rooftop. on the east side of downtown L.A. It's at the north dead-end of Heller Street. The LAPD uses the roof of the building for helicopter operations. The bridge seen in the background is where E. Caesar Chavez Avenue crosses the L.A. River. In the photo below, the police helicopter flies towards downtown L.A. The tall white spire in the center is, of course, Los Angeles City Hall. The brown tower to the left is Roybal Federal Building, at Temple & Alameda. The white building to the right is the U.S. District Courthouse, at Spring & Temple.